Offering 100% Organic Chlorella Chlorella's impressive nutritional profile has led some to call it a ""super food."" While its exact nutrient content depends on growing conditions, the species used and how supplements are processed, it's clear it packs several beneficial nutrients. They include: Protein: Chlorella is 50 60% protein. What's more, it's a complete protein source, meaning it contains all nine essential amino acids (3, 5). 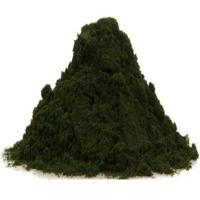 Vitamin B12: Some chlorella varieties may also contain vitamin B12, but more studies are needed (6). 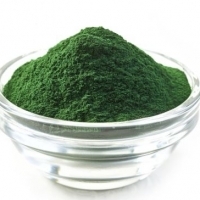 Iron and vitamin C: Chlorella can be a good source of iron. Depending on the supplement, it may provide anywhere from40% of your daily need. It's also an excellent source of vitamin C, which helps you absorb iron (1, 3, 7). Other antioxidants: These tiny green cells provide a wide range of antioxidants (1, 3). Other vitamins and minerals: Chlorella provides small amounts of magnesium, zinc, copper, potassium, calcium, folic acid and other B vitamins (1, 3, 8). Omega-3s: As with other algae, chlorella contains some omega-3s. Just 3 grams of chlorella delivers 100 mg of omega-3s (8). Fiber: In large quantities, chlorella can be a good source of fiber. However, most supplements don't provide even 1 gram of fiber per dose (1, 8)." Our proprietary micro-milled process allows the body to absorb more of the product and to Absorb it quicker. This is a natural way to get a good supply of chlorphyll which may help lower blood pressure, blood sugar, and chlorestol and it's fiber helps with normal bowel movements. Short on time? 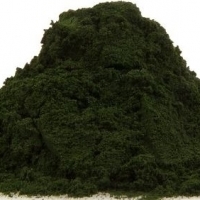 Let chlorella sellers contact you. 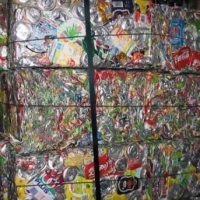 Huzhou Shengma Bio-chem Co., Ltd.
Xian Yuhui Biotechnology Co., Ltd.
We are offering a Aluminium UBC Scrap at the most competitive price in Market. Typical Al Composition, Third Party Inspection Will be done. Al: 99.7% Impurities : 3% max Moisture : 0.7% Sand : 0.06% Paper & Vinyl : 0.1% Ash : 0.1% Dirt : 0.1% ISRI Garde: Taldon, Free from any attachement, Magnetically separated from any other metal. 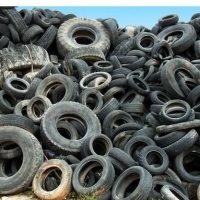 Offering a Tyre Scrap on regular Basis: We are looking to offer Tyre Scrap on a continuous basis. 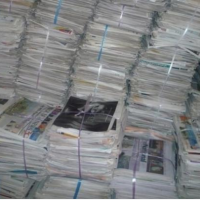 We are looking for genuine scrap buyers from all over the world. Interested Tyre Scrap buyers, kindly let us know your destination port, required quantity and terms and conditions. We can supply car and truck Tyre cut in 3 pieces. Wudi Xinhui Chlorella Co., Ltd.
Brine shrimp eggs Every carton have 12 vaccum can, every vaccum can is 425 gram.